On the trail of the Knights Templar across Atlantic Canada. The Knights Templar were the stuff of legend in their lifetime and entered the realm of fantasy after their tragic demise. That such a powerful order of soldier monks should allow itself to be destroyed by a secular ruler is difficult to accept even now, more than 700 years after the Order’s dissolution. The 2001 discovery of the Chinon parchment in the Vatican Secret Archives brought a certain amount of justice to the tarnished Order, but it did not assuage our curiosity as to what happened to those Templars who escaped the horrors of the Inquisition. Various theories place them in Wales, Ireland and the Scottish Highlands, where legends speak of buried Templar treasure and mysterious warriors who helped Robert de Bruce win the Battle of Bannockburn in 1314. Others look to Switzerland, which was not a country at the time and where Templars owned Tourbillon Castle in Sion. Where Templars received a helping hand was Portugal, whose king transformed the Order into the Knights of Christ. It was the Knights of Christ who spearheaded sea exploration and produced famous navigators in the 1400s. On the fringe of all the escape theories lies another: that Templars reached North America and came back to tell the tale. Mainstream history takes this theory as seriously as the one that the Knights Templar possessed the Ark of the Covenant and the Holy Grail (i.e., as a myth). Mainstream history claims to operate on hard facts, which is understandable, but it is also known to have propagated a myth, namely that Christopher Columbus discovered America. This myth is still being taught in schools and even defended by countries on whose coasts lie wrecks of ancient ships. (1) For a thousand years there was oral and written evidence that the Norse were acquainted with North America. The kings of Norway knew of their exploits, as did the Catholic Church. For example, bishop Gnuppson visited Vinland, the name given to North America, in 1118. Perhaps his report, too, is awaiting discovery in the Vatican Secret Archives. (2) The Norse travelled to Vinland for over three centuries and likely produced a map of it or contributed to one. The so-called Vinland map, which shows a portion of Canada, was dated to 1434 by the University of Arizona, although not everyone accepts this date. 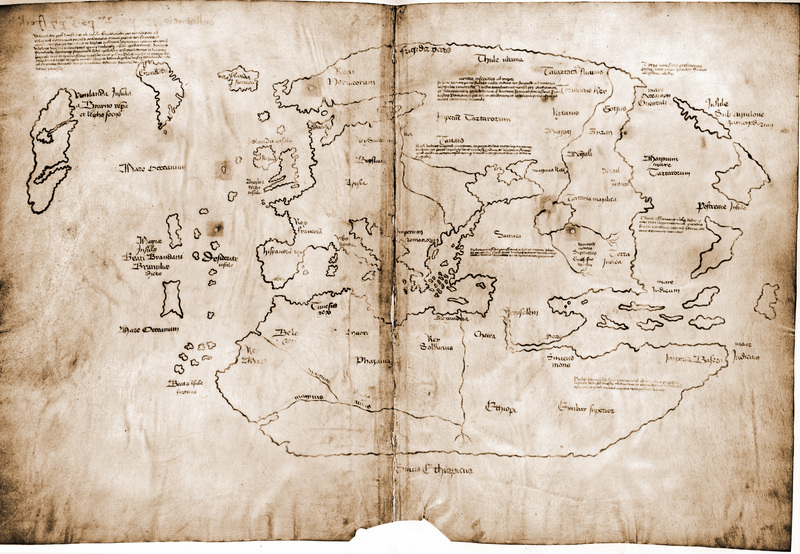 (3) The last recorded voyage to Vinland occurred in 1347, but the map was not drawn for another eight decades. There is a gap between the 1300s and the 1400s that we are led to believe no one could have filled. The problem of transport has been the main hurdle in the theory that someone else besides the Vikings could sail on the ocean. History tells us that the Knights Templar could not have crossed the Atlantic because their ships were not equipped for such a long and perilous journey. The Templar galleys were supposedly built for sailing in the Mediterranean, with its shallow waters, weak tides and the nearness of coast littered with ports where sailors could get provisions. To cross the Atlantic, one needed a larger ship that could sail into the wind. This may be true, but it did not keep the Basque fishermen from frequenting Canada’s Grand Banks in the 1400s and some say as early as the 1300s. (4) The legend of St. Brendan braving the ocean in a coracle also shows that a small vessel was capable of making such a trip. (5) Numerous artifacts found in New England suggest that the Celts from Iberia also knew about the land to the west. (6) A Shoshone Indian from the United States recognized words in the language of the Basques, who live in modern Spain. (7) Quite famous is Rosslyn Chapel in Scotland from the mid-1400s, which contains stone carvings of five different plants native to North America. (8) If Celts, Basques and Scots visited North America well before 1492, could the Knights Templar not have done the same? Christopher Columbus gives us a hint in the form of the crusader cross he had painted on the sails of his ships. Some say it was actually the cross of the Portuguese Knights of Christ, which makes it even stranger. Columbus was not a member of the Order; he was Italian, and his sponsors were the Spanish monarchs. Could it be that he expected to find a Templar outpost in North America and alert its inhabitants to his arrival? We will never know. Curiously, several other explorers who followed in his wake were fond of the same type of cross, with which they dotted their maps. Giovanni Verrazano, an Italian explorer in the employ of the French Crown, mapped North America in 1524. He used interesting place names on the east coast, such as Normanvilla and Lungavilla, suggesting he had found buildings there. On a copper globe from 1542, which was based on Verrazano’s maps, we also see crosses and medieval ships, as well as the Arctic Circle and what is probably Hudson Bay. It is interesting that Hudson Bay was not fully explored until 1610 by Henry Hudson, who sailed to it from Greenland. Where was Verrazano getting his information from? Professor Gerard Leduc, who has been researching Templars in Canada for decades, pointed out to me that in the region of Nova Scotia, the globe mentions “Cavo de Brettoni” (pit of Brittons), with the year 1178. (9) Is this an early mention of Cape Breton, or could it be that Verrazano came across the Money Pit on Oak Island, where some people believe the treasure of the Knights Templar was hidden? If Gerard Leduc is correct, then we are looking at a 12th-century visit to Nova Scotia, far earlier than the suppression of the Knights Templar. Marc Lescarbot, who made a detailed map of the Maritime provinces and the Gulf of St. Lawrence, dotted the coastline with tiny crosses pattée. Was this cross a standard cartographer’s mark? I have not been able to find out, but it kept appearing on subsequent maps as well, namely those by Samuel de Champlain. Champlain knew how to draw a normal cross, which can be seen on his 1613 map next to a cross pattée, which he used to mark places like the Minas Basin. This northern part of Nova Scotia, near the Bay of Fundy, was rich in ore (iron and copper) and mined as early as 1604. Was Champlain using the cross pattée to represent natural resources? Gerard Leduc proposes that explorers like Cartier and Champlain actually came looking for mines opened by the industrious Templars. (12) It would be interesting to know if any of the mines tapped by the 17th-century settlers showed signs of earlier activity. Nova Scotia was initially referred to as Acadia. Its first town was Port Royal, founded in 1604. When France ceded Acadia to Britain by the Treaty of Utrecht in 1713, Acadia was described as having “ancient limits.” (13) How ancient could it have been? Perhaps it was a figure of speech, and perhaps France did regard Acadia as being very old, because of a group of French Templars who had staked it out in the 1300s. Naturally, we must ask ourselves why French kings sat on this information for 300 years and did not go looking for the Templars until the 1600s. I do not have the answer. It could be that the political and religious climate of the era that followed after the Templar suppression (e.g., plagues, war and witch hunts) made such an admission impossible. Perhaps the right dynasty had to sit on the throne before it was safe to bring up the Templars again. In the 1600s, a group of Templar sympathizers arrived in Canada and founded the city of Montreal. One of Montreal’s earliest churches, Notre-Dame-de-Bon-Secours, had a classic Templar cross carved in the foundation stone, which was discovered in the crypt. (14) Complete with Masonic symbols, this cross makes us wonder if it was maybe found by the newly arrived colonists, who decided to build their church around it. These colonists were Sulpicians, another secret society from France, who fought tooth and nail for their independence from Quebec City, ruled by the Order of Malta. To refresh our memory, the Order of Malta was the former Knights Hospitaller, who had absorbed the remaining Templars and their assets. The Order was quite influential in Canada, which was almost ceded to it there. 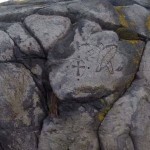 If we may return to Samuel de Champlain, in his diaries there is a mention of a cross he found in Nova Scotia: “Their labors were chiefly rewarded by the discovery of a moss-covered cross in the last stages of decay, the relic of fishermen, or other Christian mariners, who had, years before, been upon the coast.” (15) This mysterious cross is believed by some to have been Templar, but more likely it was created by the Portuguese who attempted to settle in Nova Scotia. Curiously, a citizen of Amherst found a 1362 Portuguese gold coin under an uprooted tree, suggesting that the Portuguese – and perhaps even the Knights of Christ – were voyaging to Nova Scotia quite early. (16) Another intriguing artifact is a cross in Overton, a coastal town on the westernmost tip of the province. It was carved into a granite boulder along with native symbols: a crescent moon, a feather and some type of leaves, either tobacco or palm. I have read various interpretations of this carving, from Templars to the Knights of Christ. 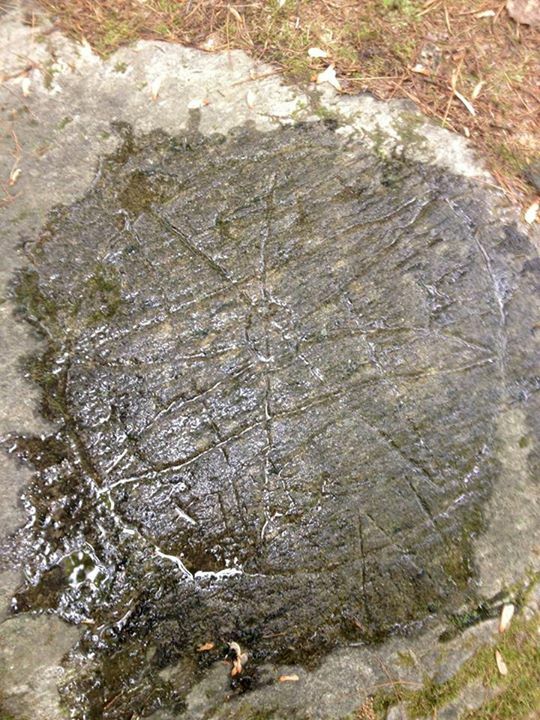 No attempt has been made by the authorities to date it, but given its state, it could easily be 500 years old. (17) My hope is that the Nova Scotia Museum, Yarmouth County Museum and Mi’kmaq Federation will take a closer look at this cross and interpret it for us. A cluster of interesting clues can be found on Oak Island, Nova Scotia. The island lies off the south coast in Mahone Bay, near the town of Chester. It is notoriously known for a futile treasure hunt that has been going on since the 1700s. Legend has it that a group of local young men ventured onto the island, after seeing strange lights in its forest, and found a round depression in the ground next to an oak tree. Their minds full of pirate treasure, the men started digging. What should have been a straightforward excavation turned into a nightmare. Team after team tried to get to the elusive treasure, some losing fortunes and lives in the process. The hole was named Money Pit because it swallowed money rather than yielding it. At a certain depth the pit started rapidly filling with sea water, which put a stop to all digging. To this day this flooding mechanism, natural or man-made, has been an insurmountable obstacle. Dan Blankenship, the oldest and toughest treasure hunter on the island, believes there are underground flood tunnels that lead from Smith Cove all the way to Money Pit. In the 1970s, he hired local divers to go down a secondary shaft known as the 10X. The divers reported seeing a cavern at 200 feet and a man-made tunnel with beach rocks. (18) This was far too advanced for pirates, who were not known for feats of engineering and elaborate booby traps. The History Channel’s docudrama The Curse of Oak Island does a good job of presenting all the various theories of Oak Island. These include King Solomon and the Ark of the Covenant, ancient Egyptians, Carthaginians, the Welsh Prince Madoc, Vikings, the treasure of the Knights Templar, Shakespeare’s manuscripts, Rosicrucians, Acadian treasure, booty from the sack of Havana and, of course, the notorious Captain Kidd. Some of the less-illustrious theories make Oak Island into an illegal salt factory and a producer of pitch. Admittedly, the Templar theory is a marginal one and probably believed by just a couple of people, one of them being me. What evidence is there to support it in the first place? For me, the most puzzling artifact is coconut fibre found in several places on Oak Island, namely inside Money Pit and in Smith Cove. The beach of Smith Cove is supposed to have tons of it spread around and covered with a layer of beach rocks. Coconut fibre is not native to Nova Scotia and had to have been brought here from the tropics, perhaps as packing material in ship crates. When it was no longer needed, it was dumped on the coast and used for keeping the flood tunnels from plugging up with impurities from the ocean. At one point, samples of this coconut fibre were sent in for lab tests, which pronounced it to be medieval. (19) Since coconut has annual growth, it is difficult to explain why a mariner from the 1600s or the 1700s would opt for coconuts 400 years old ‒ or where he would even find them. If the fibre was actually harvested in the late 1200s or early 1300s and brought to Nova Scotia in the same century, it makes the Knights Templar good candidates for the job. It also suggests that they took the equatorial route instead of coming directly from Ireland or Scotland. Another interesting artifact is a coin found by a professional treasure hunter (Gary Drayton) from Florida, who appeared on The Curse of Oak Island. The coin was in a sorry state, but Gary believed he saw a cross in its middle. The producers of the show quickly dubbed it a Templar coin, a term used for simplicity rather than accuracy. I was rather excited about it and hoped to see it again. When the coin was not brought up again, I took the initiative to track it down. I actually drove to Oak Island, where I found out that the coin had been turned in and was being warehoused in Dartmouth by the Nova Scotia Museum. The museum was unaware of the coin, but after multiple emails, they admitted they did have it, only it was not a coin. Confused, I turned to Gary Drayton, who assured me that what he had found on the ridge near Money Pit was a coin with a faint cross. (20) My request to inspect this “coin that is not a coin” has been denied so far, due to the museum’s unfinished paperwork. During my coin hunt, I was made aware of another find in Chester, where during road construction a man unearthed two medieval coins. I was able to obtain a rather fuzzy image of them and forwarded it to a professional coin dealer, who quickly identified it as “Italy, Republic of Genoa, minted from 1139 to 1339.” (21) Apparently, these coins were quite common at the time and cannot be dated any closer. The trouble with coins is that they end up in unexpected places, so it is impossible to determine how Italian currency from the Middle Ages ended up in the town of Chester, Nova Scotia. That being said, the coins were not found on a beach, but inland, which makes their discovery strange indeed. The arrival of a fleet of medieval ships to Nova Scotia would not have occurred in a vacuum. The place was inhabited by the Mi’kmaq, native peoples of Atlantic Canada. The Mi’kmaq had a system of writing, but they kept a record of unusual events within their oral tradition. To the Mi’kmaq, oral tradition is sacred, and they do not doubt it the way we doubt even our written records. Some of these stories were written down by the Reverend Silas Rand, many of them about the hero-god Glooscap. But others were not, and among them is one that relates to Oak Island. A Mi’kmaw elder once told her granddaughter that her people were the guardians of Oak Island. What they guarded and for whom is unclear, but it was meant to stay there and not be removed. (24) Another story comes from Murdena Marshall, a Mi’kmaw historian, who says white men with red beards (Vikings) used to visit Cape Breton. (25) Glooscap, too, was a stranger who arrived in Nova Scotia via Cape Breton, which seemed to be a popular point of entry. There are mounds there that have never been excavated and that could yield some interesting clues about early settlements. 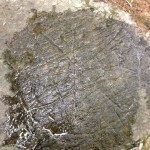 In the woods of Bedford, Nova Scotia, are several Mi’kmaw petroglyphs that have been receiving considerable attention since the airing of The Curse of Oak Island. One of them is an eight-pointed star with small crosses inside a circle. The star is also an official symbol of the Mi’kmaq Federation and represents eight bands that form the federation. The star is popularly known as Templar, but I side with the Mi’kmaq, who have a perfectly good explanation for it. We are told it was made with stone tools, which makes it pre-colonial. Another Mi’kmaw symbol to which Templar enthusiasts flock is the federation’s flag. It is a large red cross on a white background, flanked with a moon and a star (sun). The flag is erroneously called a reversed Templar battle flag. While the choice of colours and symbols is curious, the flag dates to 1903 and is not Templar. It is far more likely that it was heavily influenced by the Catholic Church, which started evangelizing the Mi’kmaq early on. Among the missionaries who were dispatched from France and who lived among the Mi’kmaq was Father Le Clerq. He was the one who realized the natives could already read and write and tried to adapt some prayers to their system of writing. He also noticed that the Mi’kmaq were deeply spiritual and that their beliefs were eerily Christian. When he saw that the Miramichi Mi’kmaq placed a great deal of importance on a symbol that looked like a double cross, he started calling them the cross bearers. We have an illustration of such a cross bearer from an 18th-century lithograph. (26) Gerard Leduc sees two symbols on the body of the cross bearer: a Templar cross and chi-rho, an early christogram. (27) The lithograph was made based on descriptions given by Abbé Mainard, a French priest from Chartres, France. It is possible that the artist took some liberties with the depiction of the native man, but then he could have followed Abbé Mainard’s instructions to a T. Incidentally, Marc Lescarbot’s map of 1609 shows two crosses pattée over Miramichi. (28) Are we seeing Templars everywhere? Nova Scotia was the gateway to Canada for centuries, especially in the age of sail. For ships travelling from the south, it was a place to stop before returning to Europe. History teaches us that Nova Scotia was not discovered until 1497, when John Cabot landed in Cape Breton, although there is no actual proof that he did. The Mi’kmaq say the Norse were there before him, but history does not take their word for it. Rosslyn Chapel in Scotland suggests Scots were here too. Who else? I believe that the Knights Templar, who had their finger on the pulse of Europe and the Middle East, could have possessed ancient maps showing North America. Their close ties with the Vatican and presence in Scandinavia meant access to reports of “Vinland.” It did not take a huge ship to cross the Atlantic, but it took skill, courage and plenty of good luck. As Graham Hancock once put it, absence of proof is not proof of absence. If the Knights Templar did set foot in Nova Scotia, did they stay here or did they continue west into Canada’s interior? As we shall see, the trail of crumbs leads to the Gulf of St. Lawrence in Quebec and the Great Lakes in Ontario. 8) These plants are maize, aloe cactus, Sassafras albidum, Trillium grandiflorum and Quercus nigra. 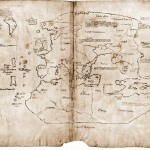 They are attributed to Henry Sinclair’s voyage to the New World in 1398. On the American side, a stone carving known as the Westford Knight is believed to represent one of the knights (Sir James Gunn) in Henry Sinclair’s retinue. From my correspondence with both Clan Sinclair and Clan Gunn, I have surmised that they are quite comfortable with the idea of their ancestors sailing to North America in the late 14th century. 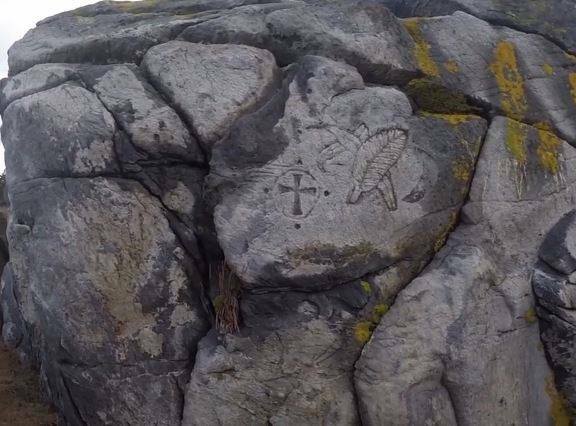 Please read the commentary below the video, by Terry Deveau of NEARA, who believes the carving could easily be 500 years old. 23) The knowledge of spherical trigonometry and the measuring of latitude and longitude is quite ancient. This is evident from the Piri Re’is map of 1513, which is a composite map created from much older sources. Among other things, it depicts the Amazon River and the Andes before they were discovered. It also shows Antarctica as it appears without its ice, which suggests the map was created before the last ice age. If you want to find out more, I recommend Maps of the Ancient Sea Kings by Charles Hapgood. 24) The source wishes to remain anonymous.